TRIVIA of Noh : Q126 : How are costumes used for many years cared for? | Home | Trivia | Q126 : How are costumes used for many years cared for? How are costumes used for many years cared for? 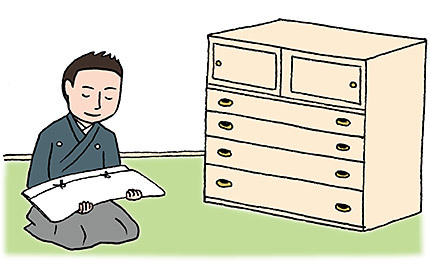 Every noh/kyōgen school has a different procedure for costume care. These vary greatly, depending on the costume’s owner and the actor’s family or school. Since shite, waki and kyōgen actors have different duties, they rarely discuss beforehand what they will wear for a performance. As a general rule, waki and ai-kyōgen actors bring several costumes to the dressing room on the day of the performance and select one of them there. They also make sure the costume chosen does not match any to be used in the other programmes performed that day. Costumes are never washed or sent to the laundry, which means they become saturated with sweat and grease from long-term use. Once a year, they are given an airing and any open seams are darned. Many kyōgen costumes are made of hemp, including shoulder-pieces, trailing hakama and kimono. The care procedure for these is called shiki-noshi. The costumes are sprayed water, then folded and placed between straw mats, which are stepped on to smooth out wrinkles. Next, the costumes are laid out to let the moisture escape. After drying, they are refolded, and ready again for use.